This costume is such a classic! 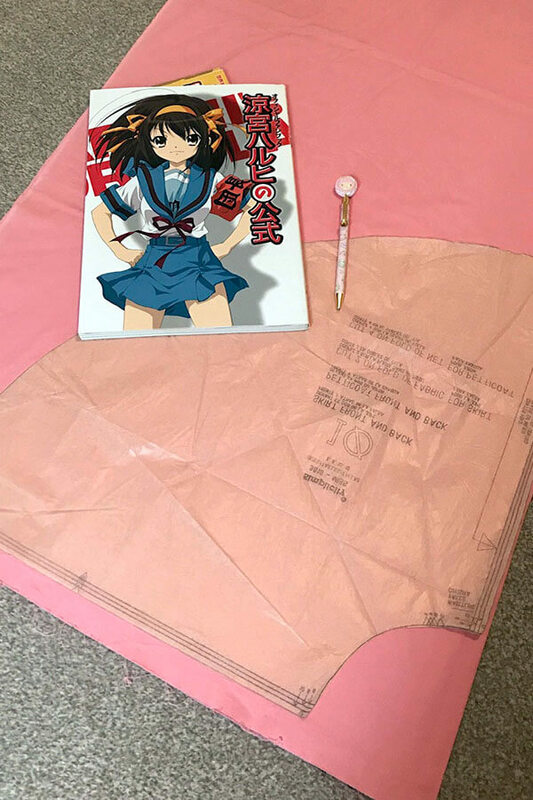 The Melancholy of Haruhi Suzumiya was one of the first series I cosplayed from back in 2006, and my original uniform was a staple for convention parties. 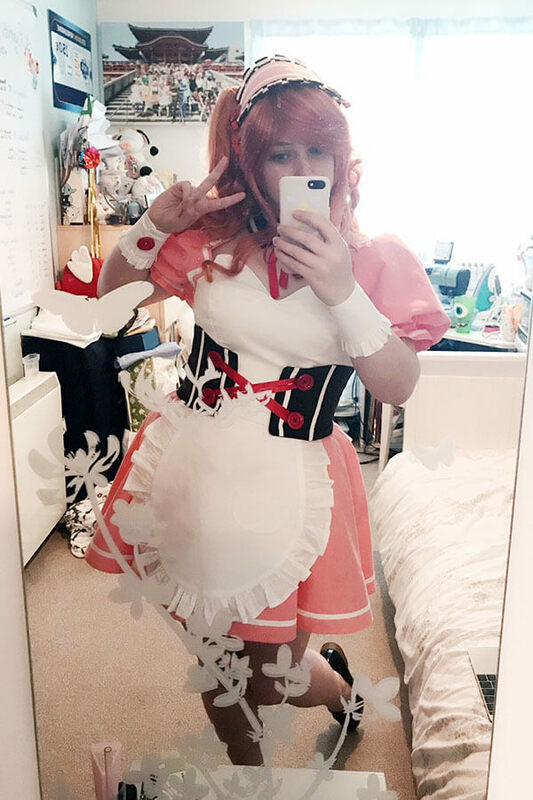 In 2018 I decided to cosplay Mikuru properly so I started working on her Battle Waitress outfit! I had a lot of fun making this and put a lot of effort into researching the design. 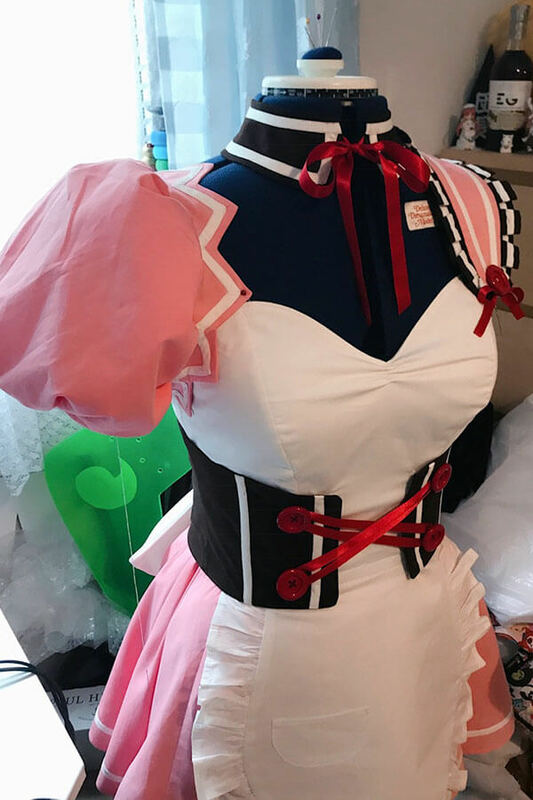 I found that almost every version of this costume online was elasticated which isn’t accurate, so I put extra time into patterning something that would be accurate, flattering and comfortable to wear. 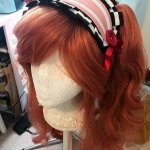 I used to cosplay Haruhi but I realised actually.. these days I’m more of a Mikuru. 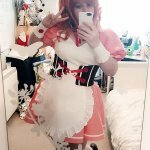 Her Battle Waitress costume is so iconic – perfect for a throwback Melancholy of Haruhi Suzumiya group at AmeCon 2018 with friends! Most of the details and colours are based on the Good Smile Company statue. References are very inconsistent for the shapes and colours, so I decided to follow it as my main reference to keep it consistent. The main colours are ivory, coral pink and brown. 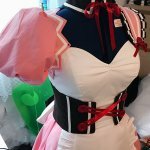 It was difficult to figure out how to make this costume as a lot of it doesn’t make sense – in the end I settled on making the sleeves, bodice and skirt as a “dress”, with the cincher and apron as separate pieces on top. 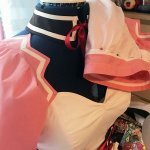 This meant I could add structure to the bodice easily and it would prevent pieces from shifting too much when wearing the costume. 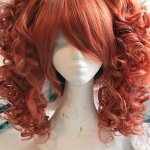 The wig is a Caine & Short Curly Clips in Salmon from Arda Wigs. 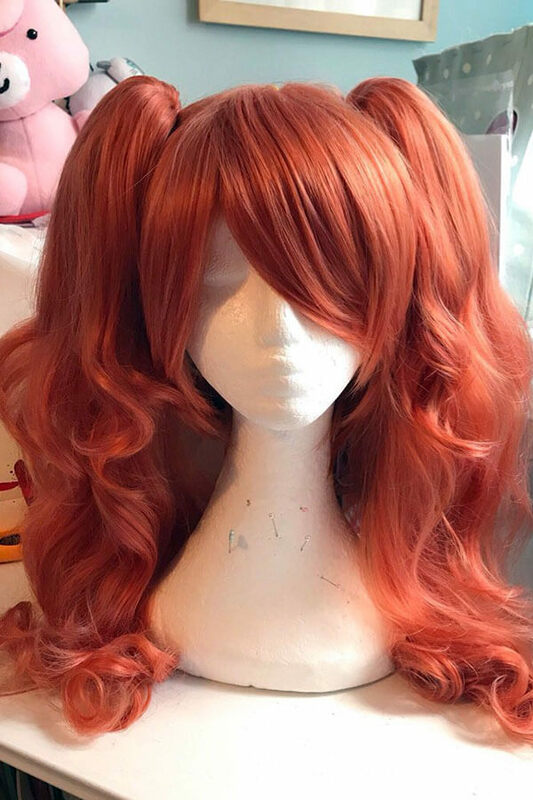 The base wig was trimmed and backcombed for extra volume and the clips were soaked in boiling water and brushed to loosen the curls. The headdress is made from pink cotton, brown drill and ivory bias. 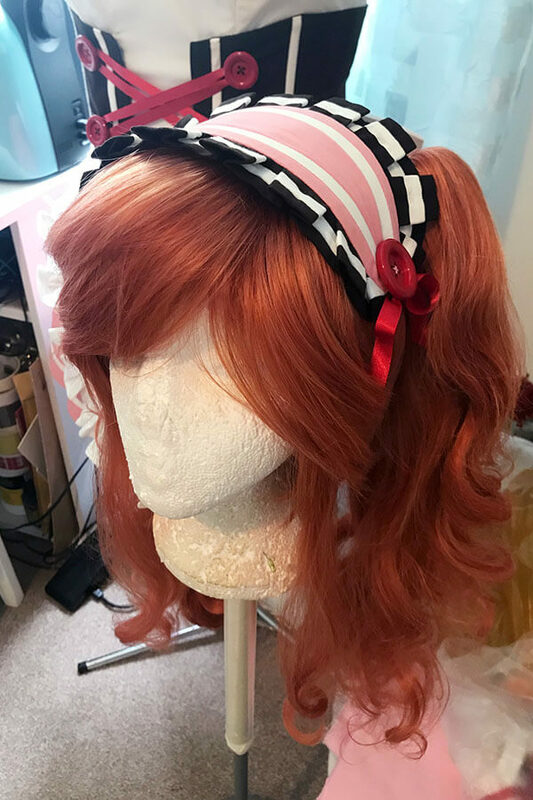 It fits into the wig with two hairpins at either edge and is finished with buttons and ribbons tied at the sides. 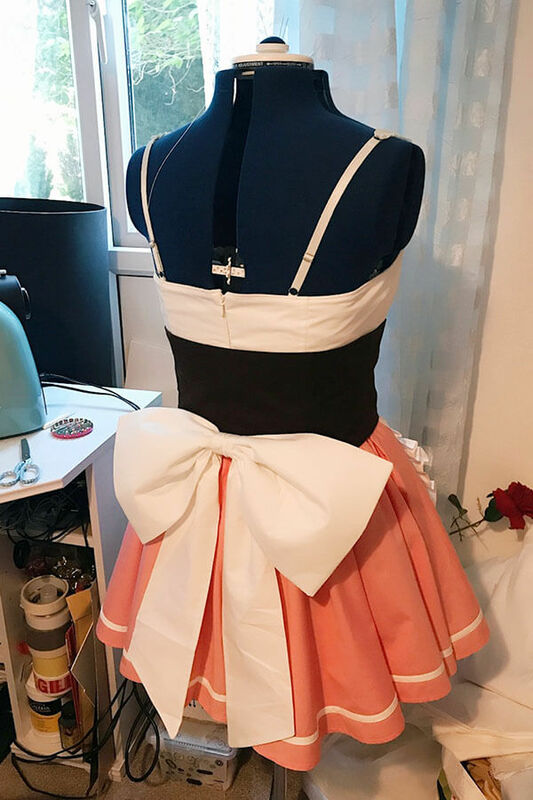 The collar is made from brown drill with ivory bias and red double satin ribbon. It is cut on a curve so it fits more comfortably around my neck and ties closed with the ribbon. To stop it from moving, I use body tape to secure it at the back. 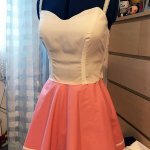 The dress is made in three parts; the bodice, skirt and sleeves. 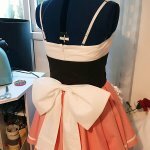 Everything is made from cotton and bias binding. 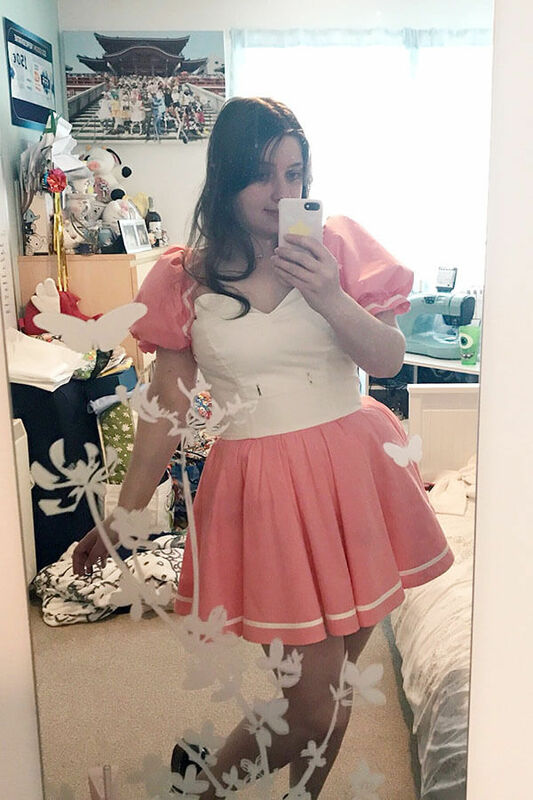 The pink cotton I used for the headdress, sleeves and skirt was tinted with Goldfish Orange Dylon Hand Dye to match the references better. The bodice is made from an original pattern with wide princess seams to emphasise the bust. 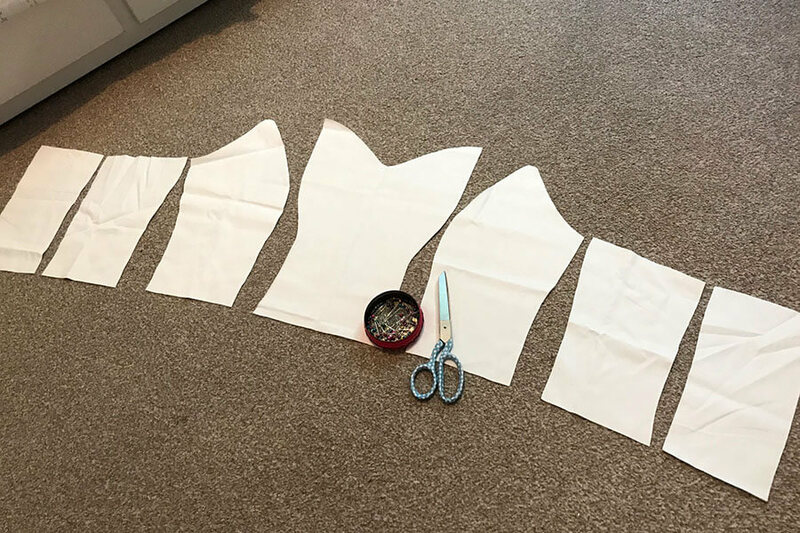 There are four bones fitted – two down the front seams finishing below the bust and two down the sides of the dress to help keep it structured. 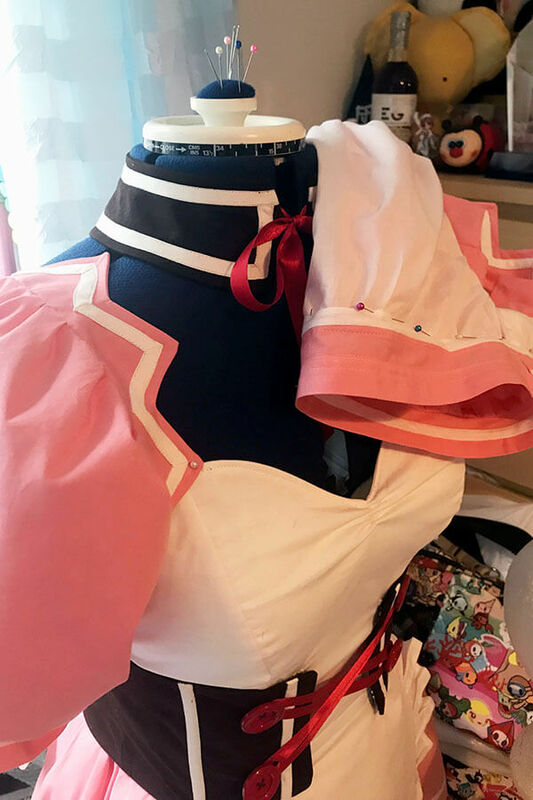 The top of the dress has a line of ribbon which extends around my neck attaches with snap fasteners at the bust. 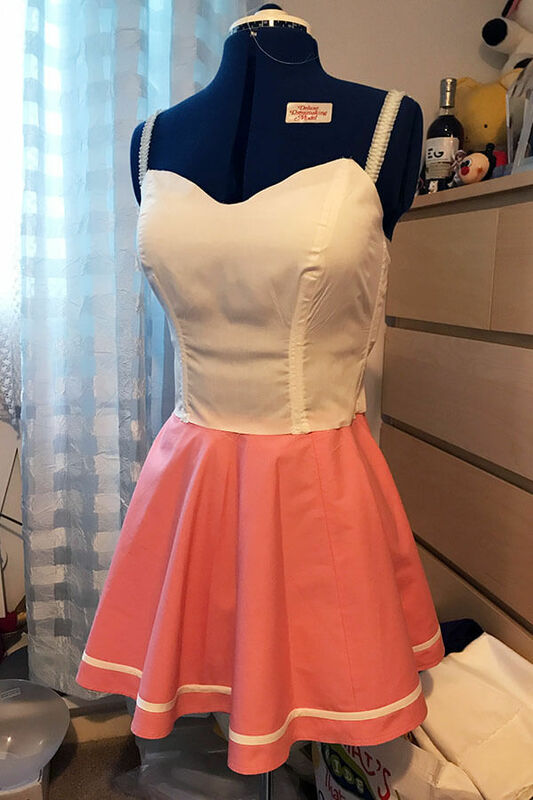 The back closes with a zipper which extends into the skirt. 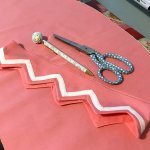 The skirt is based on a circle skirt pattern. 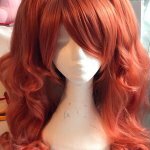 The pattern was extended from 2 panels into 3 for a little bit of extra volume, finished with bias binding around the edge. 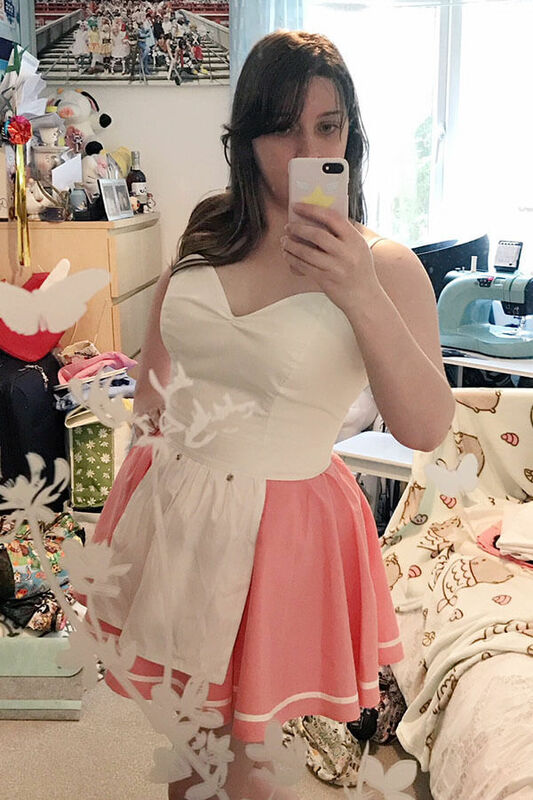 Some references showed it as pleated or pointed – I decided to make it as a normal circle skirt because I think it looks nicer in person. 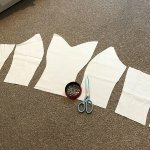 The sleeves are made from a large puff sleeve pattern I drafted myself. 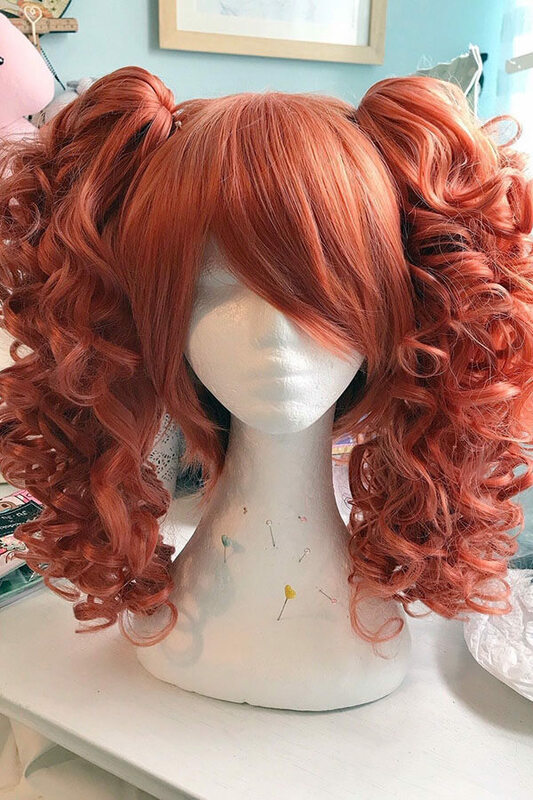 They are lined with ivory cotton and a layer of netting to keep the puff shape. The top of the sleeve gathers to fit the shoulder and is finished with a pointed trim with ivory bias. There are 9 points on each sleeve, and each point on the bias is mitered so they sit smoothly. The pointed trim is a little bigger than shown on the references, but I think it looks nicer proportionally. 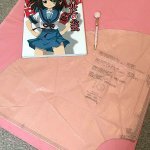 The bottom of each sleeve has a pink ruffle finished with bias. 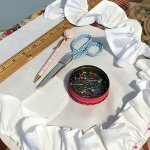 To make it fit more comfortably, I hand sewed them closed on the inside and gathered the ruffles with elastic. 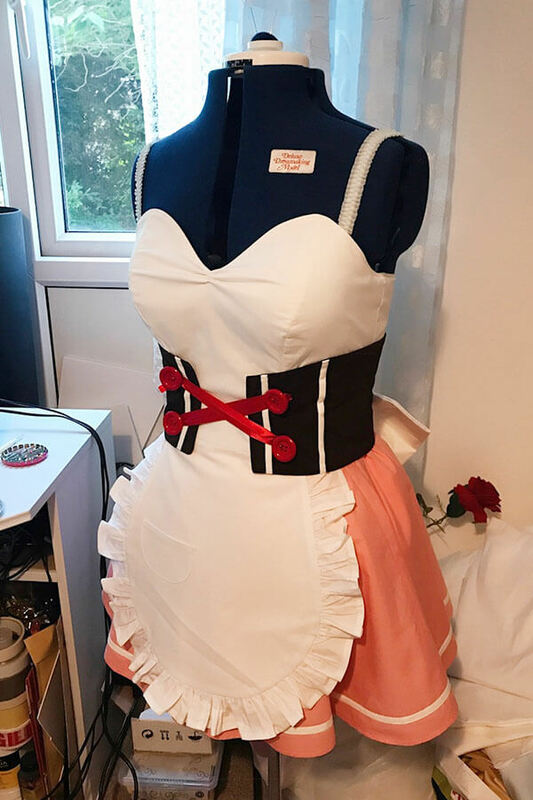 The apron is made from the same ivory cotton as the bodice. It is double layered and has interfacing inside to keep it flat. The edge is finished with hand gathered ruffles, completed with a pocket, waistband and decorative bow at the back. 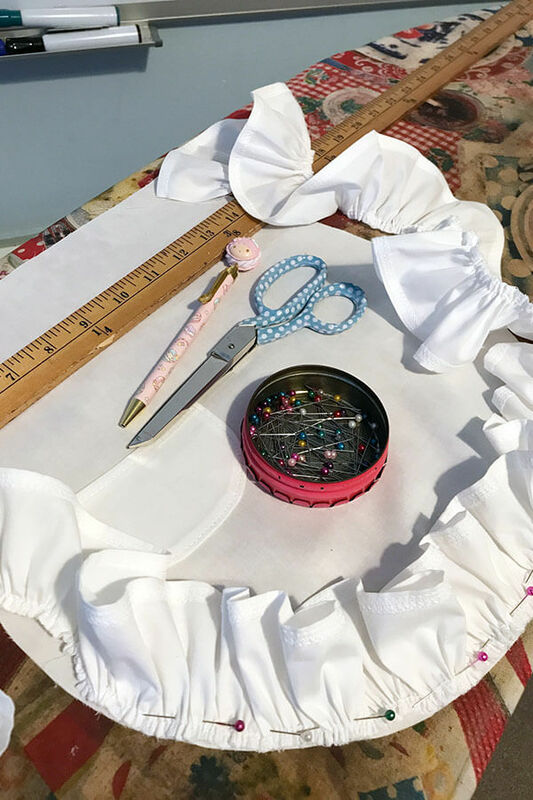 The bow has stiff interfacing inside. 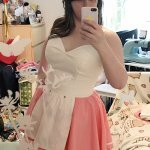 The waistband closes at the back with snap fasteners and the front has hook and bar fastenings for the cincher to attach to. The cincher is made from brown drill. 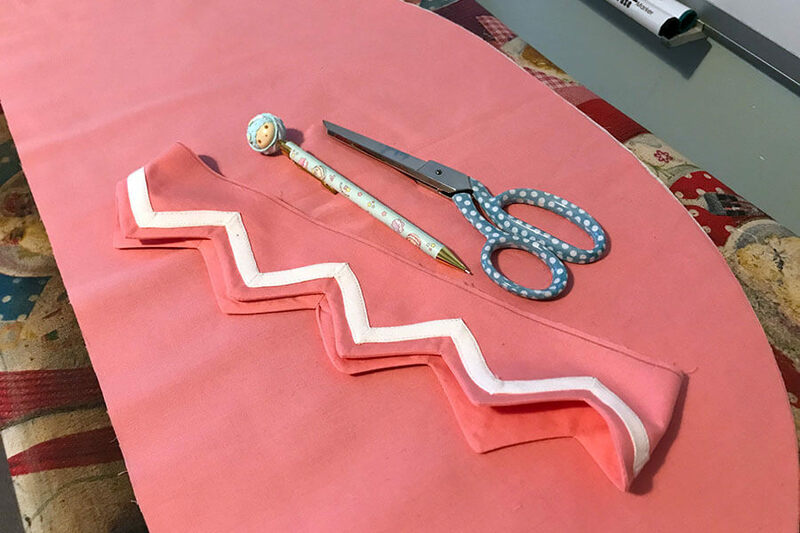 The pattern follows the same cut of the bodice, with additional lines of decorative bias. There are two bones inside the cincher at the front to keep it smooth. 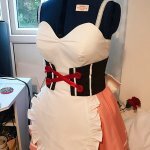 The cincher attaches to the dress and the apron with hook and bar fastenings so it can’t shift or twist when worn. It closes with red ribbons that fit over the buttons on the front with elastic. The cuffs are made from ivory cotton with decorative red buttons. They close with snap fasteners and have a decorative ruffle. The shoes are bought. 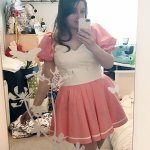 I wore shoes with a small heel instead of flats to lift my body and make the costume sit nicer!